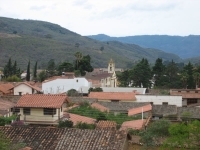 The tiny village of Samaipata lies two hours' drive southwest of Santa Cruz. Its home to an array of local tribes and some beautiful examples of Spanish colonial architecture. Visitors will encounter several important attractions, including El Fuerte, which is a set of pre-Incan ruins designated a UNESCO World Heritage Site, and the Las Cuevas Waterfalls. Condor Mountain and the stunning Amboro National Park are also nearby. Travellers should note that Samaipata is the start and end point of the Che Guevara Trail, which visits sites of interest.